Have you ever found wine crystals in the bottle? Did you know they are also known as wine diamonds? Find out what wine crystals are and whether you should be worried about them! Also stick around for a top tip on how to succeed at serving your wine at a dinner party even if you find wine crystals in the bottle. Why are there crystals in my wine? 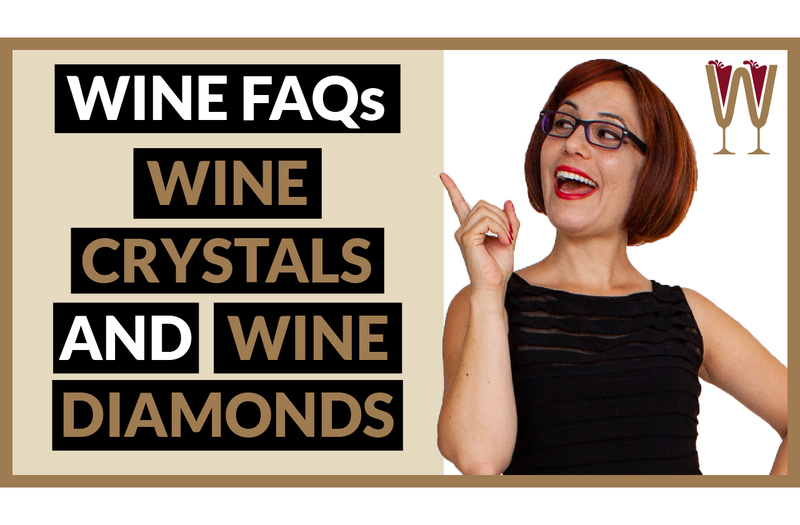 I thoroughly enjoyed researching this topic and can’t wait to share with you all the facts I have found out about crystals in wine! And stick around until the end, to find out exactly what you need to do to win at serving wine at your next dinner party – even if you find crystals after you pull the cork. Wine crystals. What are they? And how do they get into our wine? Simply, or not so simply: The wine crystals are Potassium Bi-Tar-Trate. For any bakers out there, that’s the same as Cream of Tartar. Wine crystals form when potassium and tartaric acid in grapes, bind together. But I don’t think we want a chemistry lesson here. Why don’t we call these crystals by their affectionate nickname: “wine diamonds”. By the way, Tasters, if you enjoy our videos, don’t keep it to yourself. Hit the Subscribe button and the notification bell. Be the first to watch our videos and never miss any content! Wine Crystals, or Wine Diamonds? Wine diamonds form within a few days of a wine being exposed to temperatures lower than 5 degrees – cold weather, or your refrigerator are good examples. White wines are more prone to developing wine diamonds because they have higher levels of tartaric acid. Red wines, on the other hand, are less acidic and often matured in oak. So, most of the wine diamonds are left behind in the barrels. There isn’t a bulletproof way to stop the formation of these harmless crystals. The best method of prevention is correct storage. A refrigerator is not a wine friendly environment for long-term storage. For a quick guide to correct wine storage you can read our overview on winescribble.com. Check out the link in the description below. So, are these crystals harmful? I used to find these crystals off-putting, and assumed that a wine that had formed these crystals was somehow inferior, even if it didn’t taste bad. I now know that wine diamonds only form in wines that have *not* gone through aggressive cold stabilization. This wine stabilization process prevents the formation of wine diamonds, which is desirable in mass-market products, but, it also strips the processed wines of many natural aromas and flavours. That’s why, the presence of wine diamonds is viewed by wine enthusiasts as a sign of quality. It is proof that the wine has not been over-processed. See, diamonds…they are indeed a wine’s best friend! For some fun facts about another common concern among wine lovers, the question whether sulphites in wine are harmful, check out our video on this topic. I have left a link in the description below. But is there a way to remove these crystals? If you don’t like to taste sediment on your tongue, or are planning to serve a special wine to a special guest, then the best thing to do is: pour the wine into a decanter through a coffee filter. Secure your filter to the decanter with a tight rubber band, press a two-inch well into the filter to catch the sediment, and pour the wine slowly for best results. This is a nice simple way to clarify the wine before you taste it with your guests. I would love to hear your questions about wine. Leave them in the comments section below, send them via email or share them on our social media platforms. I can’t wait to see them! So, Tasters, if you liked this video hit the like button below. If you would like us to continue making these videos please share them with your friends and subscribe to our YouTube Channel now. Remember, Tasters, those who drink get drunk. Those who taste, feel sublime. I will see you on the next video.